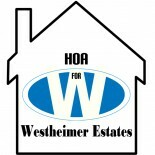 Areas of Interest | Homeowners Association for Westheimer Estates, Inc. This section is listed so that it would be easier to achieve past posts under areas that may interest our readers. This will make it simpler to categorize recent posts and will be easier for our readers to find articles that may interest them. Thank you for visiting our site and we hope you enjoy! To find your area of interest just scroll mouse over the area of interest page and you will see the sections of interest pop up on your right.